This cake came pretty close to disaster for me. See, my timer didn't go off when I was baking the cake, so it was seriously over baked. Not at all gooey and gunge-y as it was supposed to be, instead dry and rather miserable. I was too tired to make another one, so I decided to poke holes all over it and poured on two shots of espresso. It worked well to make it soft enough to eat, and it was really tasty - but I'll still give you the original recipe here. If you feel your cake is on the dry side, do what I did! The edges were a bit too hard, but hey, the cake was still fabulous so if you don't mess up like me - you're golden. And I need to get a new timer. Or two. Stir together eggs, sugar, vanilla sugar and salt. Stir in the cocoa. Add the butter, and finally the flour. Pour into a greased (and ideally lined with baking paper) springform pan, and bake at 175° for 25-30 minutes - it should still be soft and a bit wobbly. Take it out and let it cool completely - it can sit overnight in the fridge before you add the truffle. For the truffle topping, melt the butter. Add the cream and let it get warm, but not hot. Chop the chocolate and add it. Stir into a smooth, thick truffle. Pour it on top of the cooled cake (still in the springform pan) and put it back in fridge to set. Decorate with hazelnuts and sea salt just before serving, and let the cake sit out in room temperature for half an hour or so. Serve with softly whipped cream and halved strawberries. That looks very good but I am not sure I have the skills or patience to make a cake...too worried about failure! 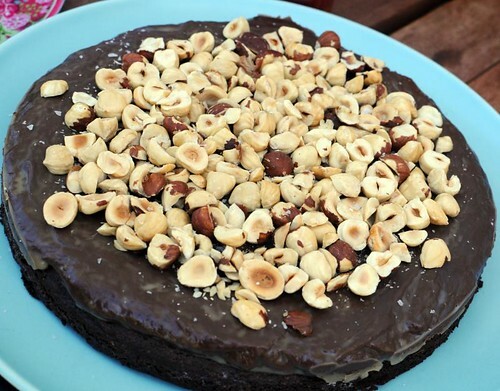 Made two of them for my birthday party - with cashew, salted roasted almonds and hazelnuts. It was a total success!!!!! this looks absolutely mouthwatering! will have to try this recipe!